It has been a while since Empire City Decals sent a sheet for review and this one is a good one. 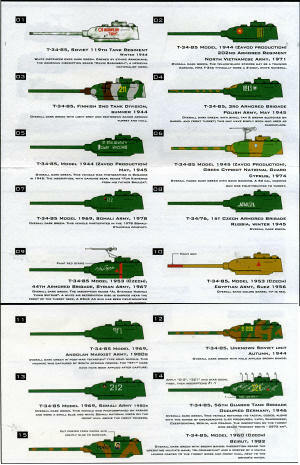 It is their first sheet for armor and they have picked a good one, the T-34/85. There are 15 sets of markings for these tanks, many of them post WWII and for some interesting countries. Since the vast majority of markings are on the turret, that is what is show n for each and every tank. For those with markings elsewhere besides the turret sides, the full color decal placement guide shows those as well. Arabic numbers in two different stroke weights are provided for those tanks that will use them. 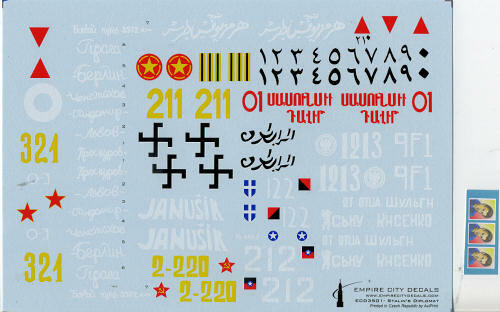 Like Empire City Decals' last sheet, these are standard waterslide markings printed by AviPrint in the Czech Republic. So let us take a look at what is on this particular sheet. The turrets are numbered left to right on down the page. 1. 119th Tank Regiment, Winter 1944 in a whitewashed winter scheme. 15. Lebanese milita, Beirut 1982. This set of markings uses the printed posters included in the set. So there you have it. No specific tank is called out, but both Dragon, Tamiya and others make a T-34/85 so finding one to use should be no problem. Several references are also provided for those who might need it. My thanks to www.empirecitydecals.com for the review sheet. Get yours from the link today!